Daniel J. Steinbock has been selected to serve as interim dean of The University of Toledo’s College of Law. 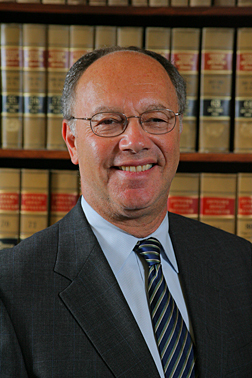 Steinbock, Harold A. Anderson Professor of Law and Values, has been a member of the UT College of Law faculty for nearly 25 years and has served as associate dean for academic affairs for the college since 2007. He will start his appointment as interim dean July 1. Dr. William McMillen, interim Main Campus provost and executive vice president for academic affairs, said Steinbock is a perfect match for the job because of his breadth of knowledge and familiarity with the college. A search committee has been named, and Steinbock’s term as interim dean will last for one year. This entry was posted on Monday, June 21st, 2010 at 5:58 am and is filed under News, UToday .